Coming to us from Jonty Jacobs is this Droëwors. Droëwors is a type of sausage seasoned with coriander, and originating from South Africa. See our reviews of their Biltong. The first thing I taste from a bite of this is the natural meat flavors mixed with a well-noticed vinegar and coriander seasoning. I can also pick up some spicy heat. There also seems to be a black pepper aftertaste as well. This has a nice, earthy aged flavor bolstered with the tanginess from the vinegar to create a lot of snackable flavor. The coriander and spices generates some lively overtones adding to what is a very snackable, enjoyable taste. Compared to the biltong offered by Jonty Jacobs, this Droëwors is indeed more spicy, but also seems to generate a more noticeable natural meat flavor. The biltong is still more tender and moist, but doesn’t quite have the lively, tangy, spicy flavor of this Droëwors. On my personal heat scale, I’d rate this as “mild-medium” (level 2 out of 5). This has a dry, light surface feel, along with a slightly moist, somewhat oily contents. Biting into a stick produces an initial crunch and snap which gives way to a slightly moist, oily inside that chews quite easily and feels somewhat along the lines of a beef stick, though not quite as a moist as most beef sticks. This Droëwors starts off with light and dry feel, biting with a crunch, and then chewing with a drier consistency than American-style snack sausages. The chewing doesn’t encounter anything unchewable, nor anything hard or bony. There are a few tough wads of tissue, but seem to be mostly the casing chewing down to a matted wad. In terms of clean eating, it’s very clean, leaving my fingers dry and clean. 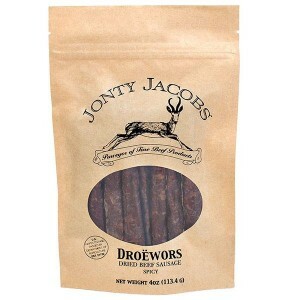 Jonty Jacobs sells this Droëwors at a price of $9.99 for a 4oz package. If you bought four packages, the total with shipping and sales tax to Southern California comes to $51.21. That’s a price of $3.20 per ounce. For general meat snacking purposes, at the $3.20 per ounce price, this is a fair value. Not having ever reviewed Droëwors, I can’t quite compare against other brands, but compared to other brands of biltong, as well as other meat sticks, it’s substantially more costly, yet is quite addicting in flavor and chewing. I’m giving this a best rating. 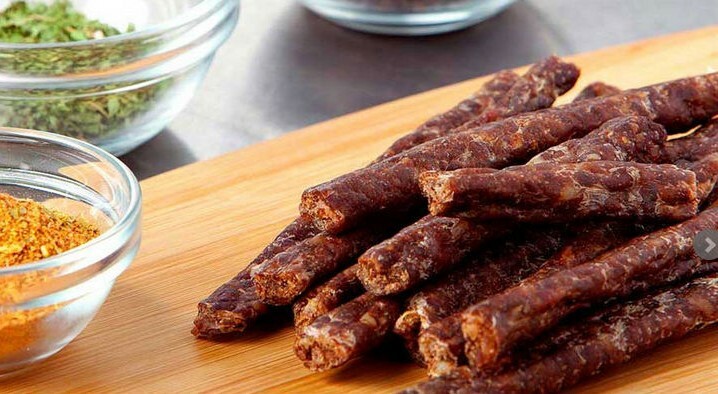 This Droëwors from Jonty Jacobs has a very snackable, irresistible flavor centered around an earthy, aged natural meat flavor bolstered with a tangy vinegar and coriander spice. For being labeled, “Spicy”, it has a low level of heat, just enough to liven up the palate without really creating any burn. What also makes this Droëwors good is the light, dry feel with the initial snap and crunch of the casing on the first bite. Inside, the contents chews with light bit of moist, oily texture for an overall pleasant chew. Compared to other meat sticks, it’s hard to beat this Droëwors from Jonty Jacobs. It’s considerably more costly than the standard American-style meat sticks, but far more enjoyable in taste and chewing experience.